Will you be attending events of Cosplay.ph at SMX Convention Center like Cosplay Carnival, Cosplaymania and the likes? 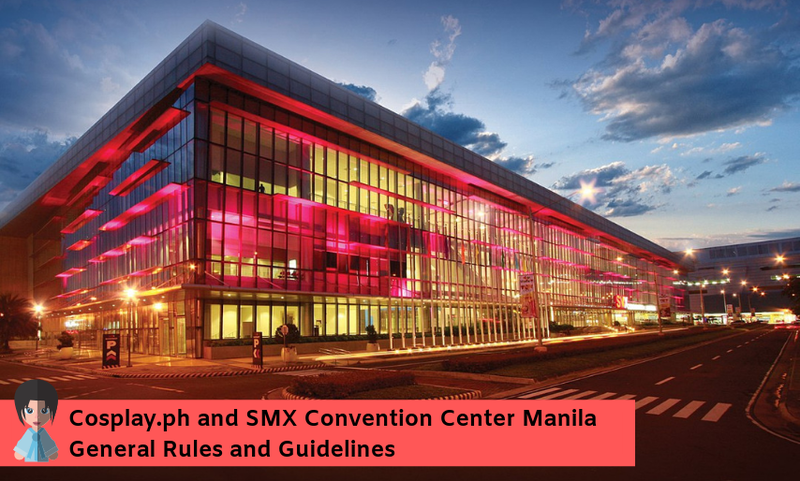 If you are then you better read Cosplay.ph and SMX Convention Center Manila General Rules and Guidelines. This is for your own safety and awareness. The following are based on the excerpt from the published rules via Google Docs. Take note that these rules will be in effect only during Cosplay.ph events in the premises and other events may have different house rules based on the event organizer. Knives, Swords, Spears that are pointed, sharp or made of metal. Airsoft Firearms and Pellet Guns with bullets. Replicas are allowed but the firing pin and ammunition must be removed. What is not allowed within the venue? Guests are responsible for the safe use of props while in the venue. If a guest brandishes any of their props in a manner that could cause injury or damage to venue, security reserves the right to confiscate the prop for safe keeping. Running, horse-play, dance performances or any activity that can result in the blockage of traffic in the hallways or walkways of the venue will not be allowed. Remote controlled toys or other robotics cannot be used in the hallways and lobby of the venue unless they are attached to the cosplay costume. Drones cannot be operated outside SMX. If they will be operated inside the event venue, security will require prior coordination (days in advance of the event) and CAAP documents. Sitting on the lobby floor of SMX Convention Center Manila is prohibited. SMX Security may ask the guest not to sit on certain areas that they believe will cause traffic or present a hazard to anyone. Eating and drinking will only be allowed in designated areas in the lobbies and hallways that are appropriated for them (such as inside the food stalls.) Eating and drinking is not allowed in the hallways, rest rooms or other public areas. Congregating in large groups while blocking the entrances or exits of the venue will not be allowed. This includes the area in front of escalators, elevators and other high-traffic areas. Food outside the venue will be allowed inside the venue but only for personal consumption. Only one piece of food and/or drink will be allowed per person. Where can I do a costume change? Changing of clothes or application of make-up will only be allowed in designated cubicles of comfort rooms assigned by SMX Convention Center Manila and agreed upon by Cosplay.ph. Can I set up a photo shoot? Photo shoots with equipment such as lights, etc. will not be allowed to set up in the lobby or hallways of the venue. They will be allowed inside the event hall or function room only with the consent and coordination with Cosplay.ph. Cosplay.ph reserves the right to refuse any set-up that they deem will have a negative effect on the traffic flow or that will present a hazard inside the venue. Also, remember that children 12 years old or below who are cosplaying must be accompanied by an adult. Cosplayers wearing bulky or heavy costumes must use the elevators rather than the escalators when traveling between floors. For the full content of the rules and guidelines, you can check this file.